November through February can be pretty bleak in London, but also an invitation to enjoy London at its coziest. There’s no shortage of inviting pubs, tea-houses and coffee shops to keep you dry and happy. 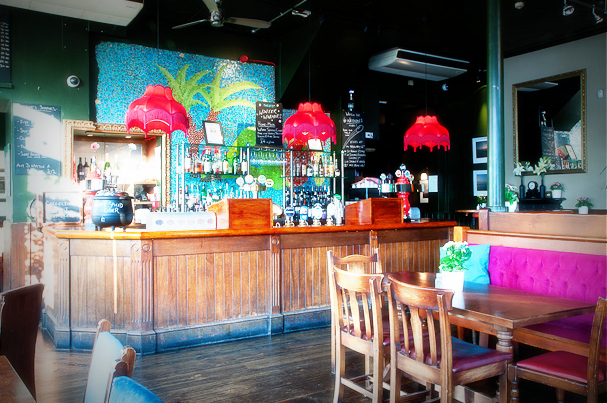 Try the Builders Arms in Chelsea for a glam version of the enduring squishy sofas/giant fireplace combo. Or if you fancy lingering over your hot beverage, LJ’s on Soho’s Winnet street has classic board games like Scrabble and Wit’s End to while away some time over. Just around the corner, Dean Street Townhouse instead offers the slightly more grownup enticement of international newspapers. Either way, one can’t have Ying without Yang- so after some happy and aimless coffee housing, it’s all but compulsory to search out a bit of higher Culture. 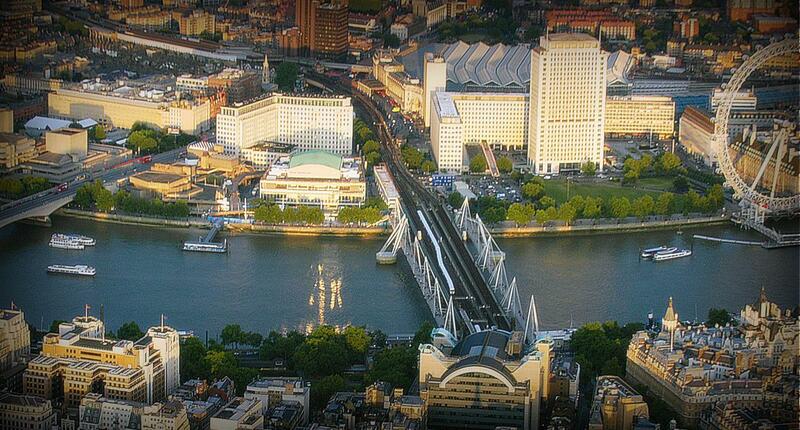 Look no further than the river’s South Bank, London’s hub for all things “The Arts”, with its cluster of behemoths housing national venues for Theatre, Music and Cinema (National Theatre, Royal Festival Hall, British Film Institute). Make the BFI your first stop, with its free and fascinating Mediateque Film Jukebox – you can drop in and explore the national archive of vintage film on literally any subject under the sun. Be warned, it’s compulsive. England’s notorious weather (rain much?) is very possibly what prompted ministers to maintain entrance to our biggest national museum collections free. Head directly to South Kensington tube station and dive right in to the biggest three – Science, Natural History and of course the V&A. But for something less obvious, Somerset House in Mayfair – only free on Mondays – will allow you to enjoy your Manet without the throngs. 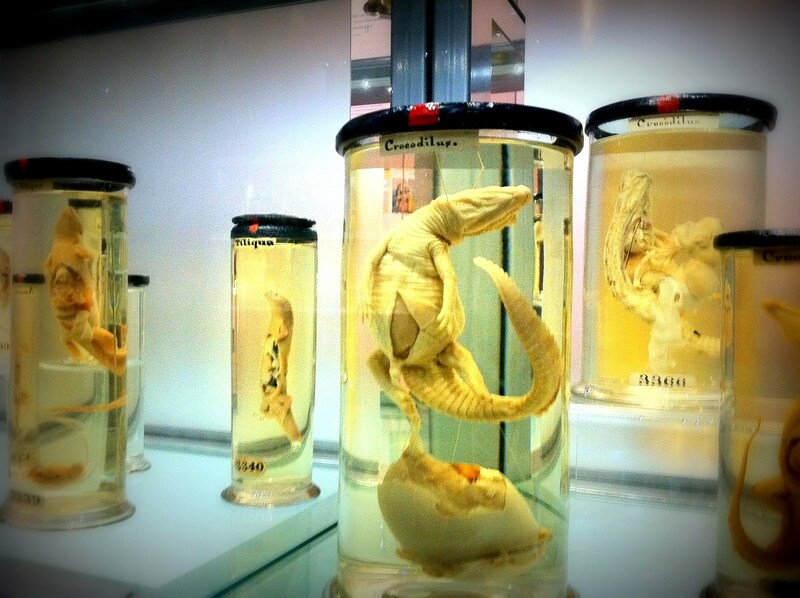 And the Hunterian museum, a small enclave within the Royal College of Surgeons, allows silent and riveting access to the dissected animals, insects and yes – babies. Not for the faint hearted. 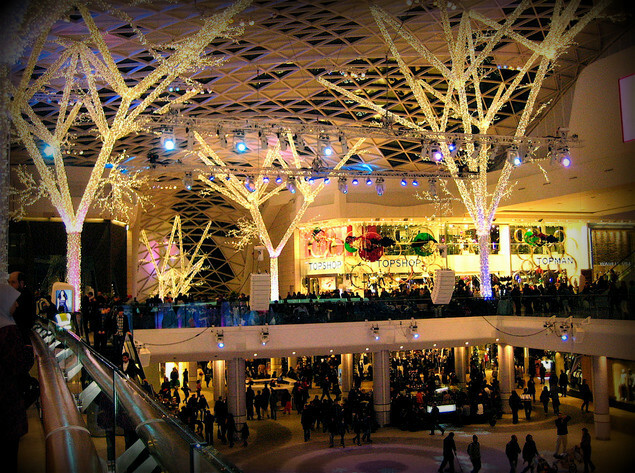 Short days require neon refuges after five, and they don’t come much brighter than the Westfield shopping centre near Shepherd’s Bush. From high end designer (Versace, Louis Vuitton) to ordinary high street chains, there isn’t a purchase that can’t be made in this mecca to consumerism. Go with an appetite, the restaurant selection is pretty broad too. If that seems far too modern an escape, travel through time and play spot-the-academic at the British Library, home to almost three hundred years and eight million volumes of books. When you’re done with the dusty tomes, enjoy some underground Bands, Bowling and Karaoke just five minutes walk away at the old-school Bloomsbury Lanes. Adored by the university students, guilty pleasure to large swathes of thirty-somethings too. 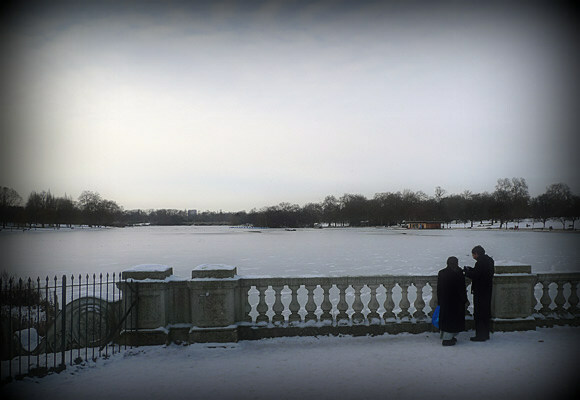 Green spaces lose their focus in these darker months, but do remember how romantic the cafe on Hyde Park’s Serpentine lake can be when the rain is lashing down outside. Definite contender for a Valentine’s moment, and with February also being LGBT history month, it’s the perfect time to search out some cut-price accommodation. Check our London apartments and B&B’s for last minute deals and rates. Every morning I walk to work in Istanbul. During my half-hour walk, there are many shortcuts and variations to my walk, but my favorite always remains the same: Çukurcuma. The neighborhood’s history dates back to the 1200s and still has buildings from that period. Çukurcuma means ‘Hollow Friday’, a name acquired when Fatih Sultan Mehmed II came to this hollow to join the Friday prayers before he conquered Istanbul. Two famous hammams, Firuzaga and Aga Hamami were built in this area right after Constantinopolis became Istanbul in the 1400s. Although its roots are historic, the neighborhood underwent a gentrification process so now bars and cafes mix with antique shops. Wandering in and out of Çukurcuma’s various stores and cafes, it is easy to get lost, but in fact this is the best way to discover any neighborhood and part of the fun of traveling anywhere unknown. As the area once was home to Armenian and Greek communities, the architecture still reflects that energy and diversity. 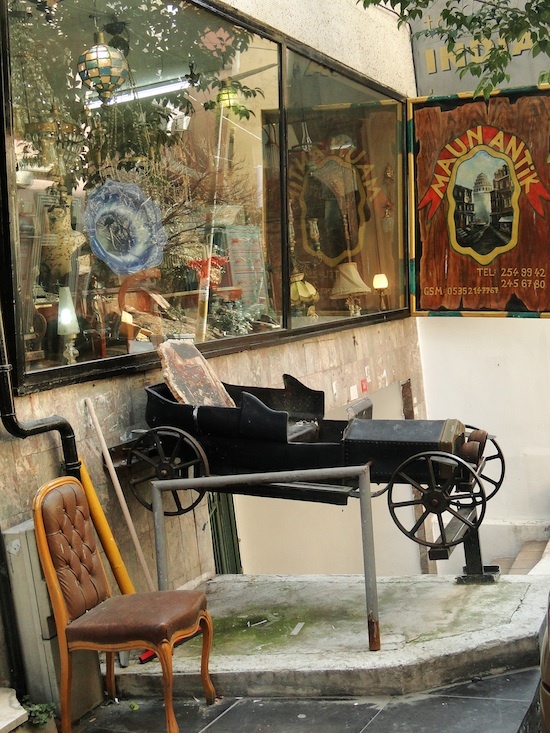 Located between the bohemian Cihangir and legendary Istiklal Street, at first glance it feels like you’re in grandma’s neighborhood with traditional grocery stores and tea houses. Then you make a turn and see a store with high-end fashion. 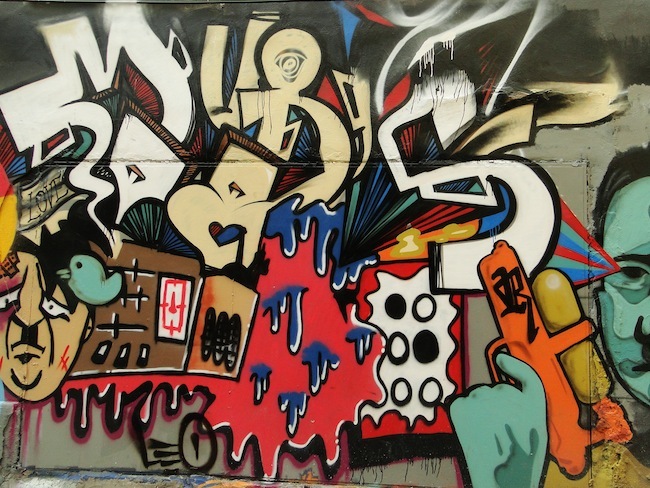 Piquant graffiti stands out on the walls. 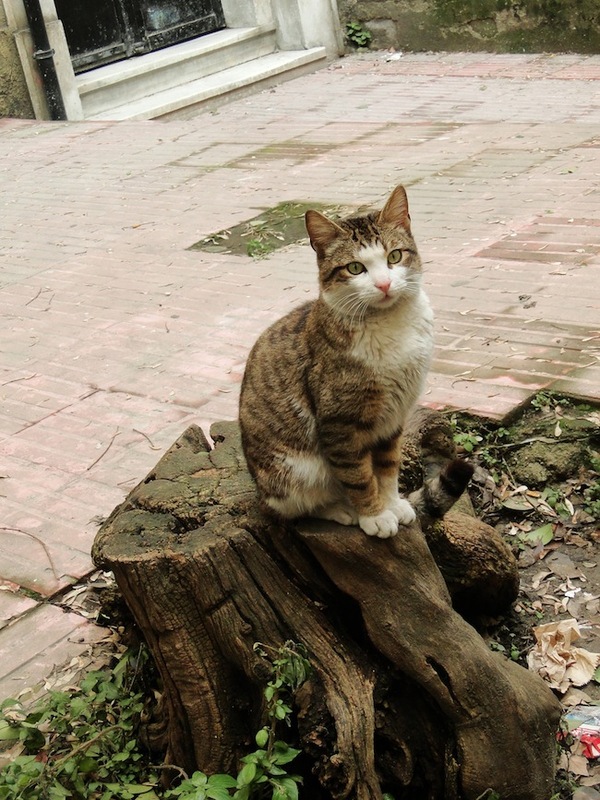 Cats are not uncommon. In fact, they are all well-fed by the residents of the neighborhood. Some houses are renovated and quite pricey whereas others show their years with character. Most of the buildings are tall with staggered roofs, hovering bay windows, crumbling arched doors and interiors of exposed bricks. The antique stores could keep you busy for hours. You’ll find furniture, old records, shoes, postcards, photos, books, jewelery, jackets, mirrors and many other objects, each with an unknown story. When you get hungry wandering around, there are a few great places to eat. 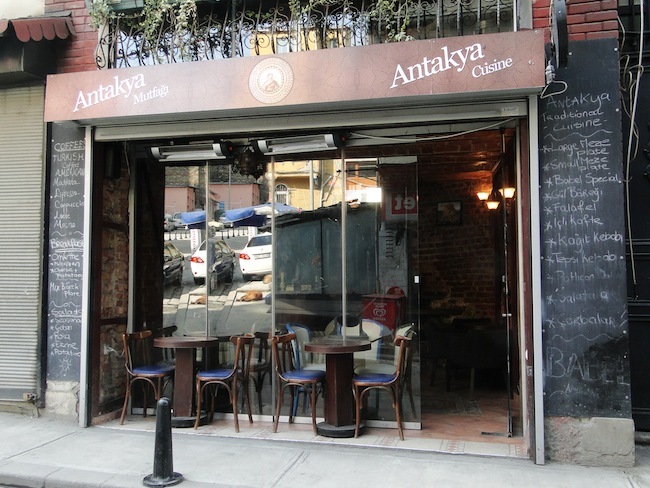 One of my recent favorites is Antakya Mutfagi with its delicious Mesopotamian appetizers. Cukurcuma Koftecisi is a classic for meatball lovers. 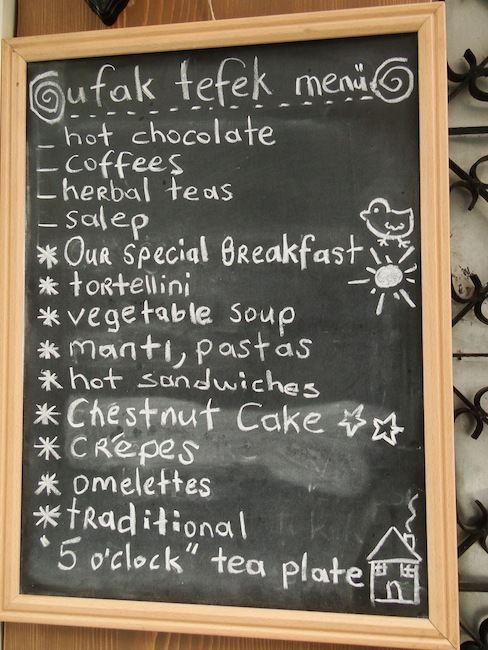 Ufak Tefek Seyler is a cute little cafe with pastries and hot drinks and has a tiny balcony. 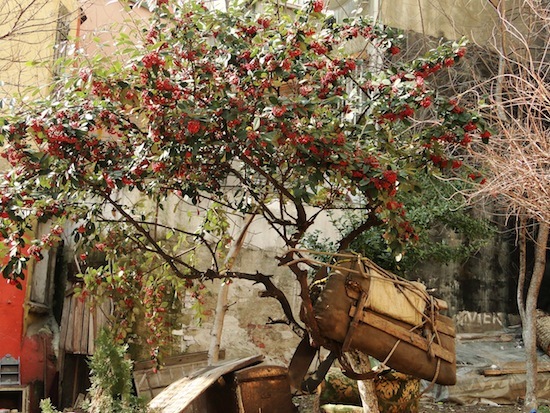 Cukurcuma is a district that mixes East and West, modern and traditional. 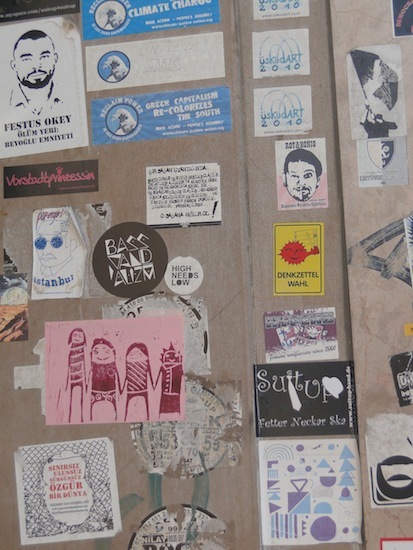 The cool thing here is an endless amount of something new (or old) to discover at some corner. 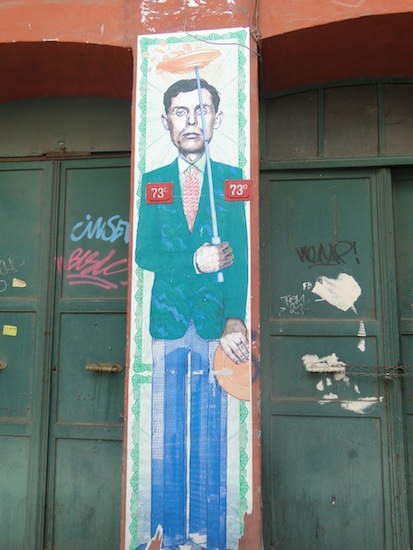 I live in Cihangir, Istanbul, which is a gentrified area, recently made popular among artists and actors as well as foreigners living in the city. Cihangir is located right behind the famous Istiklal which is an almost 2-kilometer-long pedestrian street full of food, people, cafes, bars, restaurants and theaters. As my work is at the end of Istiklal Street, I walk to work which takes about 30 minutes every day. I am a person who does not enjoy routine and gets bored easily. 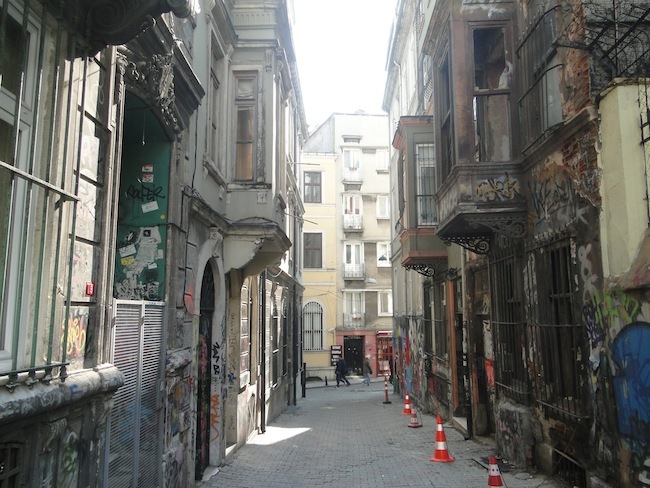 Luckily, Istiklal (we don’t add street at the end when mentioning it) has many side streets; some are dead ends, some connect with each other around the corner. I try to take a different path every day and try to entertain myself by discovering a new cafe, going over old postcards at flea markets or simply analyzing street art. 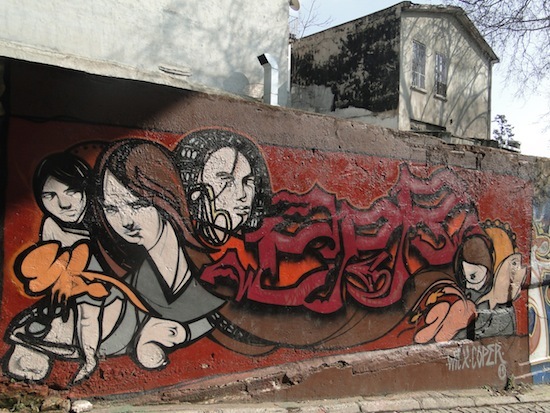 Some of the graffiti on the streets is done by local artists and some are posted by activists. It is very rare that you find profanity, even though there is often criticism. 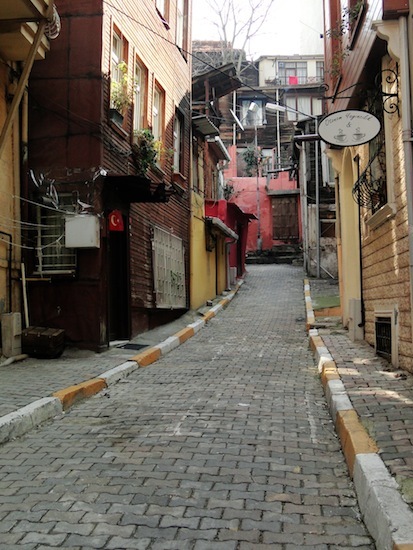 Getting lost on the side streets of Istiklal is fun and always surprising. 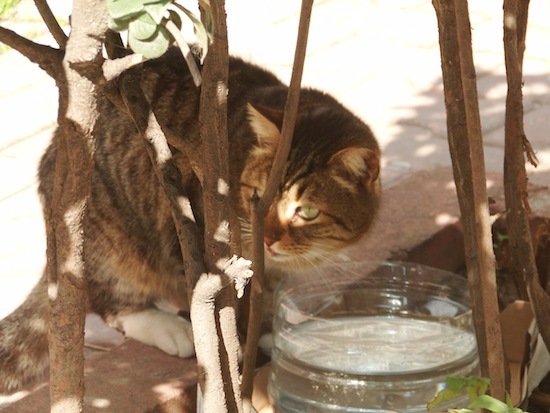 It is guaranteed that you will see a lazy cat at every corner who is fed by generous neighbors. When you start thinking that you are stuck in the middle of the buildings without any sign of nature, a rare kind of tree could surprise you. 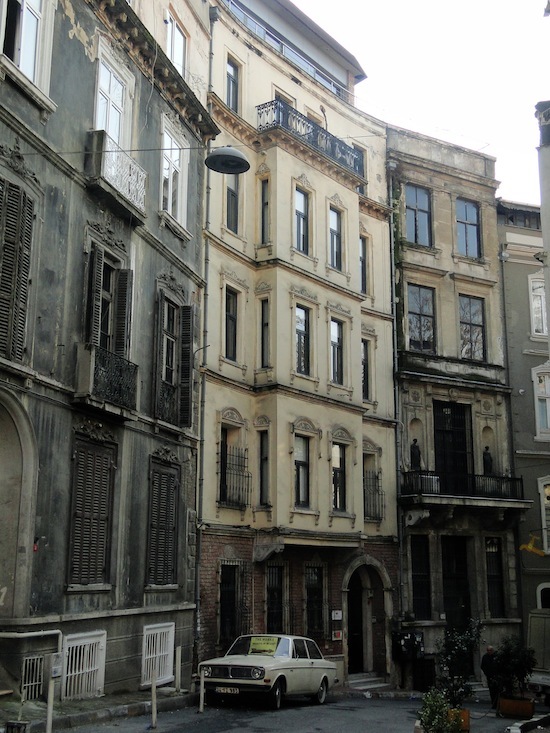 Here’s a suggested route: Go down Istiklal and turn left from Galatasaray High School, which is halfway down the street. Take a left and walk around Cukurcuma. Try some pickles at “Asri Tursucusu” which is a 99-year-old pickle store with more than 50 kinds of pickles. Go to your right and find “Cihangir Kahvesi” where all the journalists, actors and residents have their tea. Cross the street and walk around Cihangir; if you get hungry, try Susam Cafe which has a comprehensive menu and a great chef. 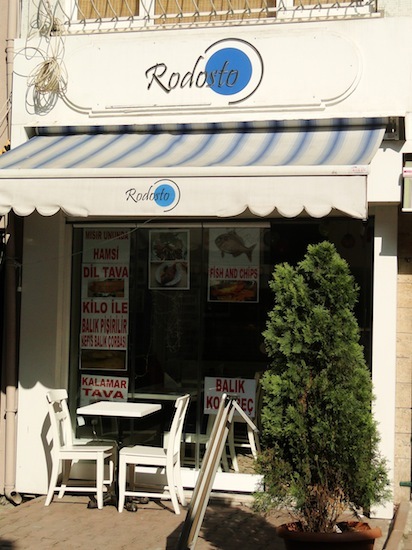 If you are into seafood with affordable prices, Rodosto is your best bet. 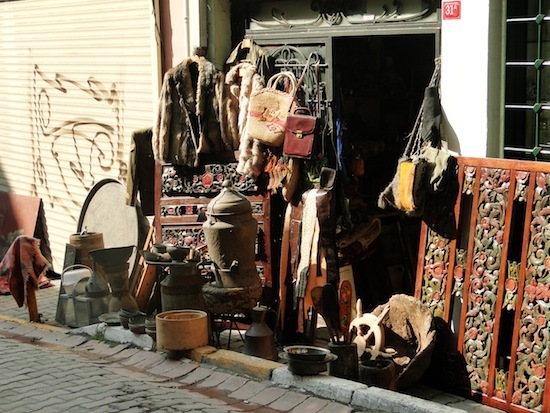 Then make your way down to Tophane and feel free to wander in the antique/flea market stores. If it is still early, you could visit Istanbul Modern, the first contemporary art museum in Turkey, right by the sea. If it is late, go next door where all the shisha cafes are lined next to one another, open 24 hours. Apple flavor is a classic and my favorite; you may want to give it a try even though other attractive-sounding ones like watermelon or coconut could intrigue you.